Fur, feathers and scales are all animal coverings or skins. Animals use their skin to stay warm and dry, protect themselves or hide or even to warn other animals to stay away. 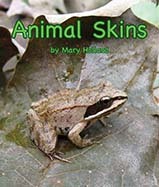 Following Animal Noses, Animal Tails, Animal Eyes, Animal Mouths (NSTA/CBC Outstanding Trade Science Award), and Animal Legs, Mary Holland continues her photographic Animal Anatomy and Adaptations series by the many different ways that animals use and rely on their skin covering adaptations to survive in their habitats. It’s common knowledge that coast redwoods are tall, tall trees. In fact, they are the tallest trees in the world. 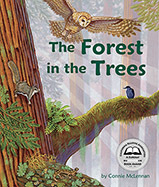 What most people don’t know is that there is a whole other forest growing high in the canopy of a redwood forest. This adaptation of The House That Jack Built climbs into this secret, hidden habitat full of all kinds of plants and animals that call this forest home.